Visiting Madrid is like visiting any European capital city. Spacious boulevards, expansive manicured parks, and neo classical facades which exaggerate the humility of the patrons. However, there is deceptively modern structure in the centre of a historical city. The latest offering from the VP family is a welcome addition to the traditional classic builds which surround the Debod Temple and Royal Palace in central Madrid. Set in a prominent location, it is ideal for shopping, sightseeing and exploring the best of what Madrid has to offer, and the bonus is, you can do it by foot! The VP Plaza España Design 5-star hotel is located at Plaza de España, and is luring local and international hipsters to this progressive new social hub. Perfectly proportioned with 214 rooms, it is not too big and not too small (however some suites are bigger than others if you are looking to impress). The rooms have everything you need for a seamless long weekend break and blend together tasteful art, design and architecture- including works from contemporary Spanish artists such as Dario Urzay and Fernando Palacios. A complete contrast to anything typically Spanish, the hotel has an airy minimalistic feel. Modern furnishings including Arne Jacobsen style chairs, low hanging lighting, modern sculptures and huge beds all evoke a Scandinavian spirit, and the spacious accommodation is a welcome break from the sticky summer city sun. Combining state-of-the-art technology and design, with modern functionality, the rooms have been thoughtfully constructed to integrate into a sleek and cosy finish without seeming soul-less. Electronically operated blackout blinds, and easy-to-control lighting are some of the nifty features, along with plenty of plug sockets (including a revolving socket bank and USB ports by the bed). The bath products are by L’Occitane products and there is a Black Mambo hair dryer, meaning vanity has not been compromised. Super luxe king size beds, and a bath, are just what you need after a tough day trotting around the city. 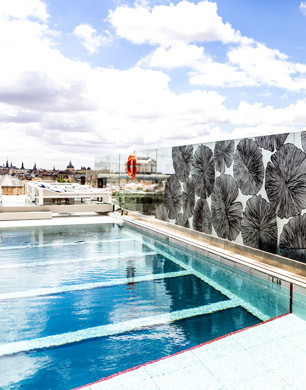 And on a chillaxed day, pop to the 12th floor terrace to admire the view from a sun lounger or perhaps take a dip in the glass bottomed swimming pool, which showcases a gigantic 25m metallic waterfall sculpture, created by Catalan artist Pere Gifre through the base. Alternatively pop to the Bilobs Wellness Suite or gym, for a soak in the hydrotherapy pool or sweat it out in the sauna. Spa treatments include eyebrow shaping, facials and pedicures, so there is no excuse not to look your best on a night out! However guests are most impressed by the breathtaking Ginkgo rooftop bar, which has a stunning 360 degree vista over the whole city. Adopting a trendy New York skyscraper vibe, the bustling world of Madrid is viewed in miniature at 82 feet below. Already making waves with the locals, who flock to the live music nights and jazz in the week and DJs from 11pm on weekends, this is the place to be seen. Designed by Studio Gronda (an international design firm from Madrid), it is deceptively spacious, with covered and open-air nooks to enjoy cocktails, conversation and watch the sunset, before getting your groove on in the sound proof nightclub. Foodies are not neglected, and the hotel offers two restaurants which remarkably for Spain are super-vegetarian friendly! 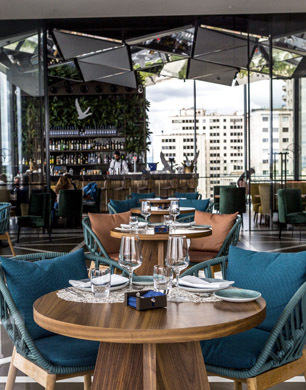 The Skybar restaurant is adjacent to the terrace bar, and also offers the same breathtaking views from the floor to ceiling windows. With a modern menu, the Asian-Spanish fusion is perfect for tapas and sharing, with a dynamic cocktail list devised by Madrid’s best mixologists. 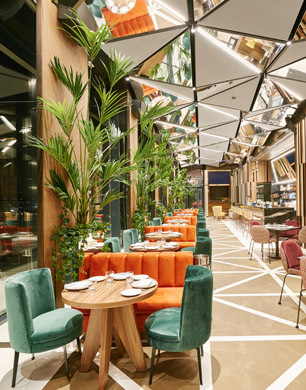 The Botania restaurant arouses a completely different sensation; Conceived by the uber cool Larrumba Group, it spreads across the whole ground floor of the property, and is an oasis of plants and greenery. The long tables are perfect for parties, but there is secluded seating for more intimate occasions. The relaxed menu and great wine list provides a buzzy ambience without feeling overcrowded- however, expect to raise the volume of your conversation as the night progresses, to keep up with the locals! 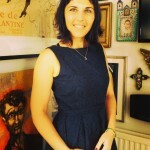 Spanish food, flamenco shows and shopping. Whether you are looking to indulge in one, two or all three, the super stylish Plaza España Design combines Scandi-chic with mid-century modern style, and is the ideal base for exploring the community and spirit of this stunning city.